Since starting OMG back in 2009, Olivia and Carter have established three main divisions within their organization. The first being obviously their Animal Conservation Division which focuses on creating awareness campaigns about endangered species both local and around the world. The second division is their Environmental Conservation Division which focuses on creating environmental awareness and educational programs designed to inspire and engage youth around the world to get involved with caring for our planet. The division has no set theme, we don’t try and tell people what they need to focus on, we merely want youth to get involved in anyway they can. Activities within this division have included collecting food for the needy or collecting and assembling personal care kits for the homeless. We have collected blankets and even hosted blanket decorating parties before donating the items to local organizations we work with. We have had bake sales and even art auctions to raise funds or supplies for families in need. We also participate in local clean up and river clean up events and even help schools with their outdoor garden beautification efforts. Whatever we can do to make a difference, we try to do and that is what we want other youth to see and hopefully get involved in. The workload of the first two divisions keeps us rather busy as is so we don’t often find time to participate ourselves in such activities within our community but as things wind down, Olivia and Carter are always looking for ways to get involved and today was one of those days where we had time and we found a fun and valuable project to participate in. Our friends at Pebble Tossers are always our first choice for finding local activities that we can get involved with. They specialize on listing a host of fun activities that are perfect for the whole family. 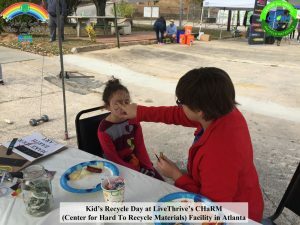 A few weeks ago we saw that they were looking for volunteers to help out at the “Kids Recycle Day” event that the folks at LiveThrive were hosting. The event was being held at the CHaRM (Center for Hard to Recycle Materials) facility in Atlanta and they were inviting everyone to come and bring their hard to recycle materials free of charge to their facility. The folks at LiveThrive invited various organizations to set up booths with fun family activities such as craft building, face painting and a fun bean bag toss game which helped educate the visitors on what can and can not be recycled. They even had a cool compost container making section which was very popular. The event was a huge success and they collected lots of materials that are deemed ‘hard to recycle’ which means they prevented all of these items from needlessly ending up in our environment, and that is why this facility is so important to our community. We encourage you to reach out to the folks at CHaRM with any questions you might have and definitely consider loading up your car, truck or van and bring them your ‘hard to recyclables’ next time you are cleaning house and be sure to tell them OMG sent you. If you and your family are looking for a great way to get involved in local activities to help your community, please contact the folks at Pebble Tossers or other volunteer group in your neighborhood and start making a difference today.